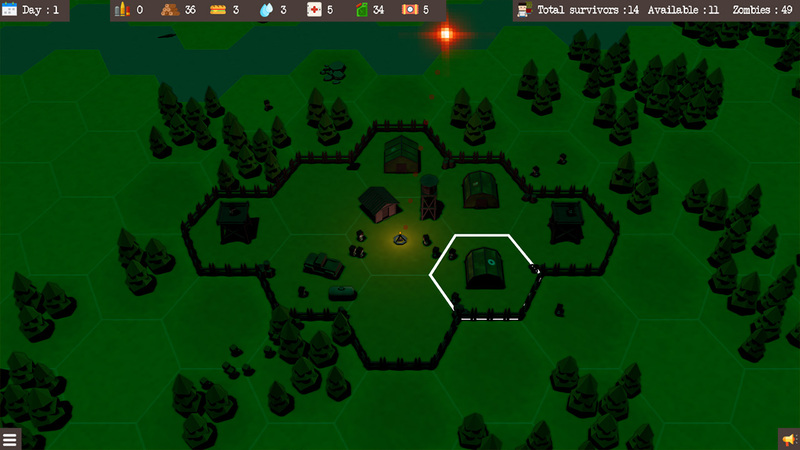 A funny mix of Real Time Strategy and Survival games : Your goal is to manage a group of survivors against zombies. You play sessions on a virtual 3D gaming table with a parametric and randomly generated map. For each session of the game, the player have to keep a certain amount of humans alive during a determined number of days. You have to protect your base camp too. If, it's destroyed by the zombies, you lost the game. As soon as a zombie touches a survivor, it is infected and will soon turn into a living dead. You don't direct the survivors but perform out actions and make strategic choices by clicking on the terrain tiles. 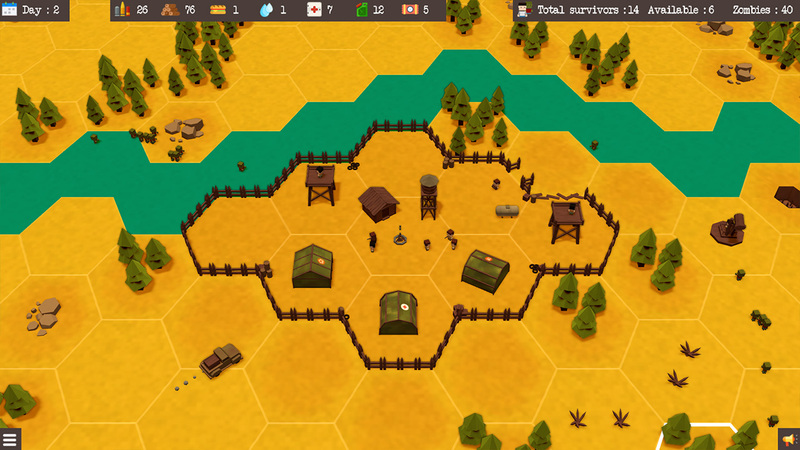 A good starting point consists to collect a lot of wood and build your barracks inside the camp. Find out where the zombies come from and install traps wisely. In addition to the traps, only the defenders can kill the zombies, so think about placing them inside or around the camp. 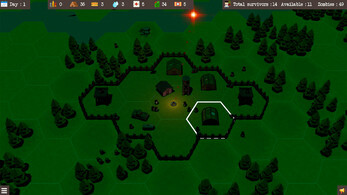 Quickly, survivors will have some needs, so you have to go and look for new resources. Explosives (limited in the demo version) : make zombies flying away ! Game options : two camera modes (step by step or smooth movements), soft shadows, Ambient occlusion and Music Player (default tracks are included but you can put you own MP3 files). More details in the player guide, inside game. 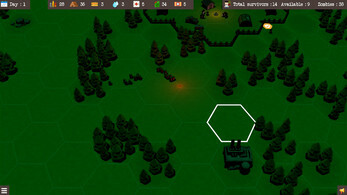 The game is available for Windows (Vista and above) 32 & 64Bit and Linux 64Bit. It's a standalone software, so you don't need additional library. An OpenGL compatible graphic card is needed. Try the free demo, if it works on your system, the full game will work too. On Windows systems, some antivirus softwares may alert you when launching the game ("suspicious application" or something like that). The only reason is because it is not certified by Microsoft. There is no virus :-) Sorry for that inconvenient. The game is out ! Demo is waaay too short and zombies maybe too many for the first day? Will this be available on mac? Only Windows and Linux, sorry. 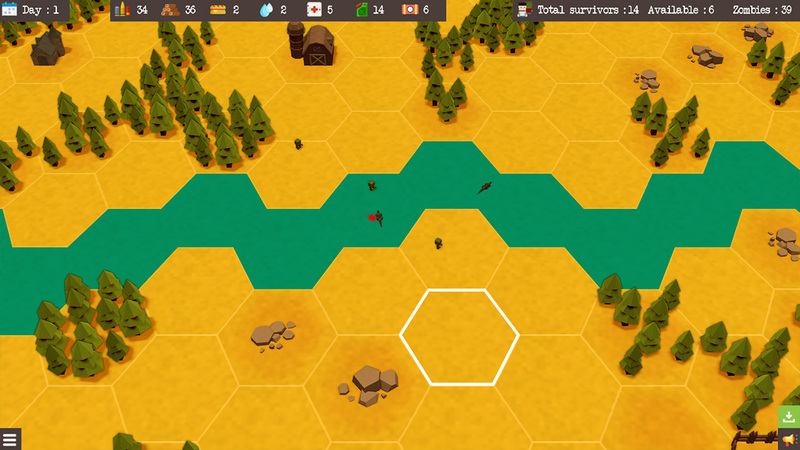 There is a complete white board, no map or terrain is loading up, but options are visible. i have inbuilt Intel GPU 1GB and 8GB RAM, Core i3 processor. Please help me. Did you try to update your graphic card driver ? 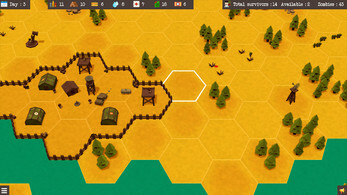 First off , interesting game and thank you for supporting Linux. I do have a few issues with my survivors being killed very easy when they go scavenging for supplies. Some die from the touch of a single zombie , others poke several zombies and walk back to base. 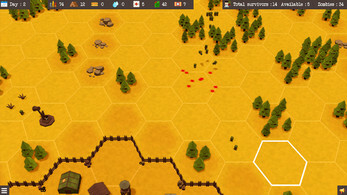 Could you implement a health bar or mechanism for survivors to fight/flee ? I hope I am not missing anything obvious. Hello razing32 and thanks for your interest ! In general, as soon as a survivor is hitten by a zombie, he becomes infected... and dies. Only "Defenders" can fight against Z (by shooting them), the other survivors always flee if they're too close to a Z. 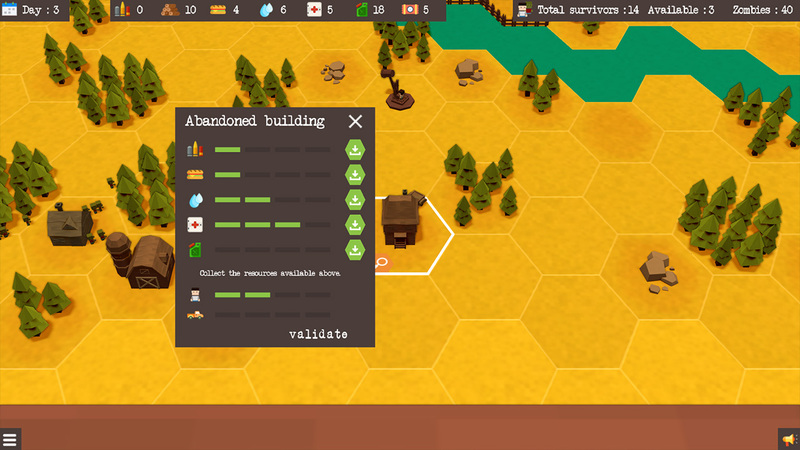 When collecting supplies, if you don't use the pickup, your "explorers" are vulnerable and zombies can infect them when they are inside a building. 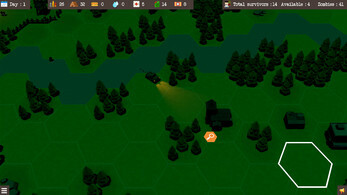 So sending some "Defenders" beside the explorated building or using the pickup is a good idea :-) Anyway, because the game is not yet finished, I'm always looking for bugs, thanks for your post... I will analyze the behavior of explorers. Glad to see that there are still people using python for game development. Bought the game after trying the demo. Played my first game and they all had some sad face or something and then the survivors wouldn't do anything at all. How do I fix this?! Read the player guide, the "Inside the camp" section to understand more. 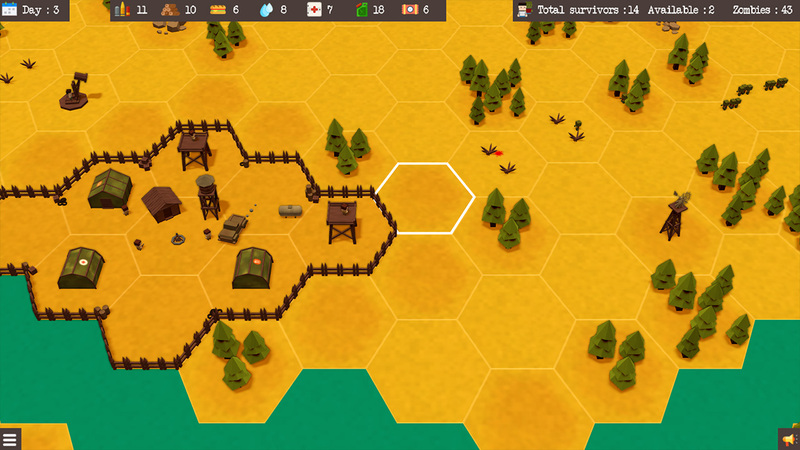 This is not a bug, only a bad luck game :-) The difficulty parameters are adjusted in each releases. Ok, I get that. I have another question, since I have survivors just sitting there by the stock pile, is there at least a way to get more? If not, is there a way to get the idle ones to be useful? I really don't understand this game or what I'm supposed to do, but I won somehow.... I don't get why I can't make more survivors or go beyond the camp. I also don't get why they stop doing stuff. I bought the game so I guess I'll wait for futher developement. how i can get updates? When a new version is released, you have to download and extract it on your computer. There is no auto update system in the game. I really like the game and I hope that you keep working on it, so that it turns into a great game! 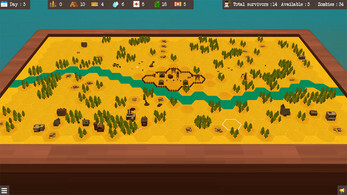 Wabby's Land in the future this game will be Free to Play? Seeing that far too money is unlikely will ever Free to Play. The PayPal page has a Credit Card option, seems a pretty set of options.